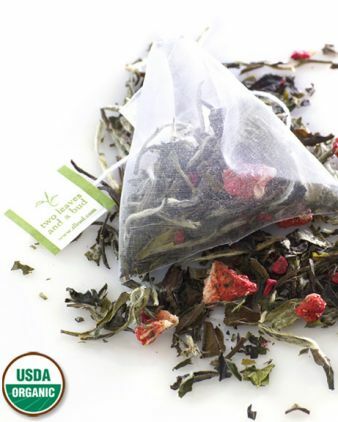 Special harvest long whole-leaf tea leaves and buds create this super light but full tasting white tea. Light enough in the cup to be called “white” with acai flavor to round out a great cuppa’. The rich taste is a distinct combination of berry flavor and subtle chocolate. Try iced with a touch of agave! I admit it – I’ve never actually tasted an açaí berry. I’ve had quite a few teas that are flavored with açaí berry. Many of those teas have been quite tart to the point of being too sour for my personal taste. As a result, I’ve acquired a bias against açaí berries. This is a really tasty tea. It has a soft, gentle white tea flavor that is fresh and smooth, and is not obscured by the flavor of the açaí berry. I can taste the chocolate-y notes that the company description suggests, and I can also taste the berry and the berry flavor is sweet. Yes, I said SWEET. Not tart. Not sour. But pleasantly sweet! This tea is not completely void of tartness (it really wouldn’t be a berry flavored tea without just a little bit of tart flavor, would it?) and there is a tart note that hits the palate in the finish. It sort of tingles! It’s not unlike the way my mouth feels and tastes after eating a fresh berry. Not pucker-y tart – just a tingly tartness that lets me know that I’m drinking a berry flavored tea.